ETHIOPIAN AIRLINES - CEO, Tewolde Gebremariam from CAPA on Vimeo. Ethiopian Airlines is planning further fleet and network expansion in 2015, enabling the flag carrier to widen the gap with other leading African carriers. Ethiopian has already become the largest airline inAfrica based on fleet size and could overtake South African Airlines (SAA) in 2015 as the largest based on passengers carried. Ethiopian has doubled in size since the beginning of the decade while most other major African carriers have grown only slightly or not at all. Asia and Africa have been, and will continue to be, the primary drivers as Ethiopian taps the booming Asia-Africa market. Ethiopian plans to launch services to Tokyo in Apr-2015, which will become its 11th destination in Asia. The carrier will also add its second US destination in Jun-2015 as service to Los Angeles is launched. Ethiopian is one of only four airlines in Africa with over 5 million annual passengers. It is also one of only four airline groups with a fleet of more than 50 aircraft. 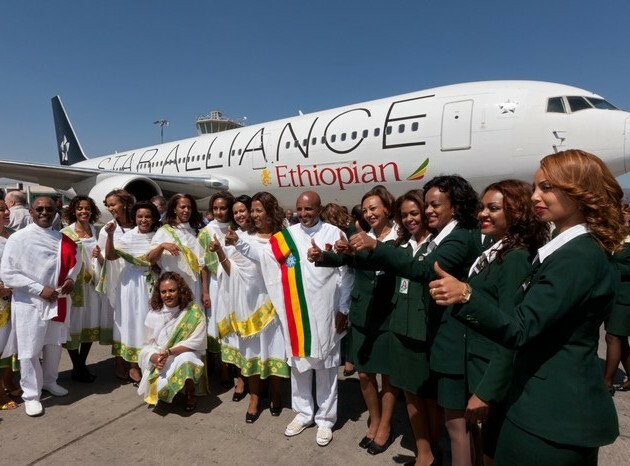 Ethiopian surpassed the 5 million passenger mark for the first time in the fiscal year ending 30-Jun-2013 (FY2013), when the government-owned flag carrier transported 5.22 million passengers. Passenger traffic reached 6 million in FY2014 fuelled by 15% year over year growth. Passenger traffic has more than doubled since FY2009 and has grown at a double-digit clip over the last six years. The other three African airlines that have at least five million annual passengers have recorded virtually zero growth over the last six years. SAA carried about 7.1 million passengers in FY2014, maintaining its position as market leader in Africa based on number of passengers carried. But SAA traffic is below FY2008 levels, when it carried 7.4 million passengers. 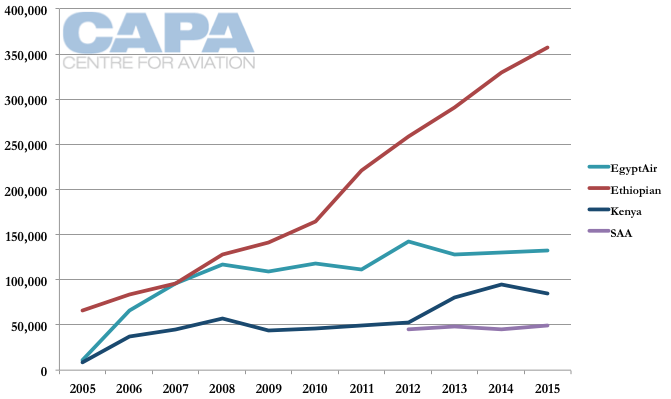 (SAA traffic shrunk FY2009, FY2010, FY2011 and FY2012 but grew slightly in FY2013 and FY2014). 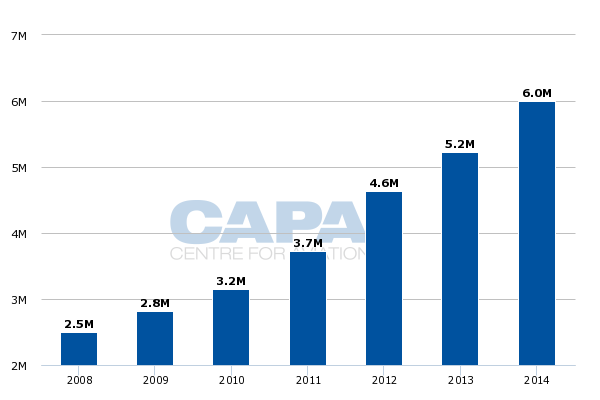 As EgyptAir and SAA are both pursuing restructurings in 2015 their traffic levels will likely drop below seven million. RAM is again expanding but not as ambitiously as Ethiopian. As a result Ethiopian could soon become the only African airline with 7 or more million annual passengers – if not in FY2015 almost certainly in FY2016. This is a remarkable achievement given that SAA carried three times as many passengers as Ethiopian in FY2008. 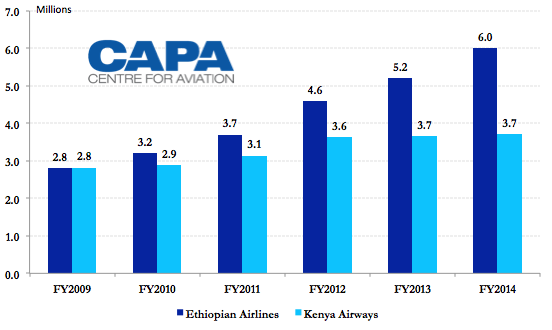 EgyptAir and RAM were also more than double the size of Ethiopian in FY2008. But perhaps the best comparison is between Ethiopian and its biggest rival, Kenya Airways. Kenya Airways was slightly larger than Ethiopian in FY2008, when it carried 2.8 million passengers. Kenya Airways transported 3.7 million passengers in FY2014. Its average annual growth rate has been only about 5% since FY2008. (Kenya Airways’ fiscal year ends in March). Kenya Airways has pursued a similar strategy to Ethiopian, expanding in Asia and regionally within Africa to leverage the ideal location of East Africa for Asia-Africa flows. But Ethiopian’s expansion in Asia has been much faster and its pursuit of Asia-Africa transit passengers is much more aggressive. Kenya Airways also has been set back by instability in its home market. After growing rapidly in FY2011 and F2012, Kenya Airways traffic figures were relatively flat in FY2013, FY2014 and 1HFY2015. Kenya Airways currently has only four destinations in Asia compared to nine for Ethiopian Airlines. Ethiopian also has eight more regional international destinations in Africa – 45 compared to 37 for Kenya Airways, according to OAG data. In the key market of mainland China, Ethiopian has more than tripled annual capacity since 2007 while Kenya has pursued relatively modest growth. Kenya Airways currently only serves one destination in mainland China, Guangzhou (daily), along with Hong Kong (three weekly flights). It has so far failed to move forward with longstanding ambitions to launch Beijing and Shanghai. Elsewhere in Asia, Ethiopian and Kenya Airways both serve Bangkok and Mumbai. Only Ethiopian currently serves Delhi, Kuala Lumpurand Seoul. Delhi is served non-stop while Kuala Lumpur is served via Bangkok and Seoul via Hong Kong. Ethiopian will pursue further expansion in Asia in Apr-2015 as Tokyo is added and Singapore is resumed. Tokyo will initially be served with three weekly 787-8 flights via Hong Kong starting 20-Apr-2015, according to Ethiopian’s online booking engine. With the launch of the new Tokyo route Hong Kong will be upgraded to a daily non-stop service. Singapore will be served with three weekly non-stop 787-8 flights from 2-Apr-2015, according to Ethiopian’s online booking engine. Ethiopian initially launched services to Singapore via Bangkok in Dec-2013 with a four times per week 767 service via Bangkok. But it reduced the service to three weekly flights in Apr-2014 and to two weekly flights in Sep-2014. It has since temporarily suspended service to Singapore and is currently offering offline connections via Bangkok on Singapore Airlines (SIA). As CAPA previously outlined, the new non-stop option should be able to improve Ethiopian’s performance in Singapore as it will open up one-stop connections to Australia and New Zealand and offline destinations in Southeast Asia. Unlike Ethiopian’s other Asian gateways, Singapore has limited local traffic to Africa but can be used as a hub for offline traffic leveraging Ethiopian’s partnership with SIA. Ethiopian also began codesharing with All Nippon Airways in Oct-2014, a sensible move ahead of its launch of services in the Japanese market. Ethiopian has been building up partnerships with Star members since joining the alliance at the end of 2011. In Asia Ethiopian also codeshares with Asiana and Air India but does not currently work with Thai Airways, which leaves SIA as its partner for Southeast Asia, Australia and New Zealand. The new non-stop service to Singapore, launch of Tokyo and upgrade of Hong Kong to daily is made possible by additional 787 deliveries. Ethiopian also plans to use its expanding 787 fleet to launch in Jun-2014 three weekly flights to Los Angeles via Dublin. Ethiopian plans to take three additional 787-8s in 1H2015, growing its 787 fleet to 13 aircraft. These are the last three 787s from the carrier’s 13-aircraft commitment. Ethiopian is also slated to receive two additional 777-300ERs in 1H2015. These aircraft will not be used on any of the new long-haul routes but can be used to up-gauge existing 787 routes, freeing up 787s. As the 777-300ER is Ethiopian’s highest capacity aircraft it is logical to use the type on its thickest routes. Ethiopian has been using the 777-300ER on a wide variety of routes, rotating the aircraft around depending on the time of year. Los Angeles will become Ethiopian’s second destination in the US after Washington Dulles, which is served daily with 777-200LRs. Ethiopian has also augmented its presence in the US market with a new codeshare with United Airlines that was implemented in Nov-2014. Los Angeles and Washington Dulles are both United hubs. Ethiopian also currently serves Toronto with three weekly 787-8 flights. Washington Dulles and Toronto are served non-stop eastbound but both flights stop in Rome on the westbound leg due to payload limitations in departing from the high altitude of Addis Ababa. Dublin will become Ethiopian’s 10th destination in Europe. Ethiopian has continued growing its network in Europe – adding Madrid,Stockholm and Vienna in 2014 – and now in North America. But the primary focus for Ethiopian has and continues to be on expanding in Asia and within Africa. Ethiopian CEO Tewolde Gebremariam told CAPA TV in Nov-2014 that the airline believes most of its future growth opportunities are in Asia, Africa and Latin America. He pointed out that that while “Europe is a strong market for us,” most of the growth over the last decade has been to Asia and China is now Ethiopian’s single largest market. Ethiopian’s leading African network and increased presence in Asia along with Addis Ababa’s location gives the airline a strong competitive position in pursuing transit passengers heading between Asia and Africa. “This trend line is the fastest growing trend line today in the world,” Mr Gebremariam said, referring to the Asia-Africa market. In Africa, Ethiopian in 2014 launched services to Kano in Nigeria and resumed services to the Seychelles. Further regional growth is expected in 2015 as the airline is adding three 737-800s in 1H2015. Ethiopian also has reportedly been discussing acquiring a strategic stake in government-owned flag carrier Rwandair and launching a new joint venture carrier with the government of South Sudan. If finalised both deals would cement the carrier’s leading position in the East African market. Ethiopian also has discussed over the last year potentially establishing a joint venture airline in the Democratic Republic of the Congo, which would serve as the group’s hub for Central Africa. Ethiopian already has a 40% stake in Togo-based ASKY and a 49% stake in Malawian Airlines. It helped launch ASKY in 2010 while Malawian was launched in Jan-2014 as a joint venture with the Malawian government. ASKY currently operates a fleet of eight aircraft – three 737-700s and five Dash 8-Q400s turboprops – seven of which are owned by Ethiopian, according to the CAPA Fleet Database. Malawian operates one 737-800 and one Dash 8-Q400, both of which are owned by Ethiopian. All the ASKY and Malawian aircraft are registered in Ethiopia but are operated under local air operator certificates. ASKY currently links its hub in Lome with 18 destinations, giving Ethiopian access to several secondary markets in West Africa. Malawian currently links its Lilongwe hub with eight destinations, giving Ethiopian an expanded presence in Southern Africa. Ethiopian serves Lome and Lilongwe from Addis Ababa, enabling it to leverage the group’s hubs in other regions of Africa. Ethiopian also stops its Addis Ababa-Sao Paulo service in Lome, enabling connections in the small but fast growing Brazil-West Africa market. Including ASKY and Malawian, the Ethiopian Group currently has a fleet of 79 aircraft – more than any other airline group in Africa. The fleet operated by Ethiopian Airlines currently consists of 69 aircraft, including 60 passenger aircraft and nine freighters. This also makes Ethiopian the largest single carrier in Africa. Notes: Regional airline groups are not included in this ranking. SAA includes Mango but not SA Airlink or SA Express as they are independently owned. Ethiopian plans to roughly double its fleet over the next 10 years, enabling it to maintain its status as Africa’s largest airline. Ethiopian’s fleet has already more than doubled in size over the last five years. At the end of FY2009 Ethiopian’s fleet consisted of only 34 aircraft, including 29 passenger aircraft and five freighters. Ethiopian currently has orders for 20 737 MAX 8s, 12 A350s, three 737-800s, three 787-8s, two 777-300ERs and two 777Fs, according to the CAPA Fleet Database. Ethiopian has been negotiating a potential order for 777X aircraft as well as for additional A350s. Ethiopian currently only has 32 new aircraft commitments for delivery in 2016 and beyond as all the remaining 737-800s, 787-8s, 777-300ERs and 777Fs on order are slated to be delivered in 2015 (with all the passenger aircraft coming by the end of June). New orders or commitments will be needed to maintain the recent growth clip in 2016 and beyond. Ethiopian also has been a standout in the African airline industry from a financial perspective. The airline has reported profits every year this decade while most other large African carriers have been in the red. Ethiopian’s profits nearly doubled in FY2013 to ETB2.05 billion (USD113 million) as revenues increased 14% to ETB38.5 billion (USD2.124 billion). Ethiopian has not yet reported financial figures for FY2014 but the airline was likely again in the black – albeit at a reduced level due to the Ebola outbreak impacting demand to and from West Africa. On several measures Ethiopian has quickly emerged as Africa’s leading airline. Perhaps most significant is the group’s still evolving role in setting up joint ventures throughout Africa.Ethiopian’s willingness to develop aviation across the continent is noteworthy particularly given that other major African carriers have been unsuccessful over the years with similar pursuits. Ethiopian still faces challenges and obstacles in its quest to again double in size over the next 10 years. But the flag carrier enters the next phase of its development with a level of scale and efficiency that is rare for Africa. Its achievements over the last several years in a market where most others have struggled puts Ethiopian in a strong position to cash in on the growth and vast potential that Africa offers. We are offering exciting packages to UGANDA if you are traveling from USA.